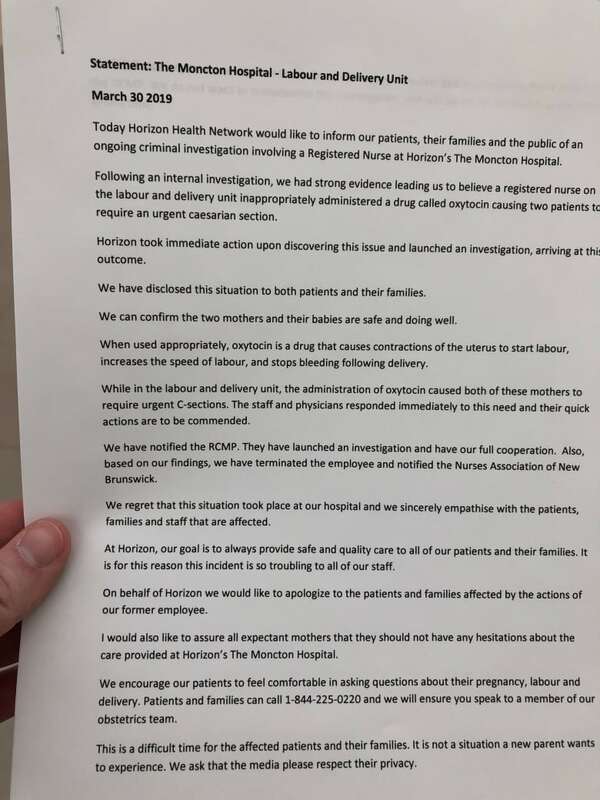 A press release from Horizon Health said it fired the labour and delivery nurse after an internal investigation revealed "strong evidence" the nurse administered Oxytocin, which caused two patients to require an urgent caesarean section. Horizon said it took immediate action to launch an investigation. Oxytocin is a drug that causes contractions and is used to induce labour, speed up labour and stop bleeding following labour. If it's not administered properly, contractions can become too strong. "Our investigation at this point has identified these two patients and these two patients alone," said Ken Gillespie, an obstetrician and chief of staff of Moncton Hospital, when asked if there could be more than two patients affected. The press release also said the two mothers and their babies are "safe and doing well."